"So bold, even a meat eater wont care that it's meatless!" 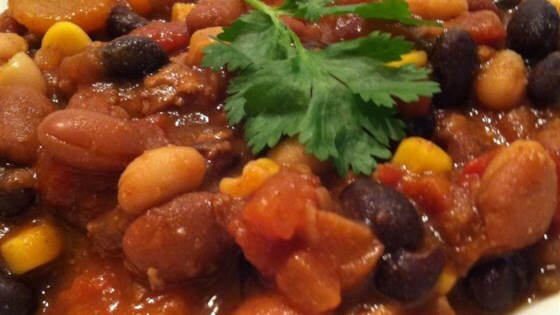 In a slow cooker combine vegetarian crumbles, kidney beans, onion, celery, bell pepper, bay leaves, chili powder, molasses, bouillon, cilantro, hot sauce, salt, pepper and 1 cup water. Cook on high for 3 hours. Dissolve flour in 1 cup hot water. Pour into chili and cook 1 more hour. This chili was fantastic. My meat-loving husband even had a bowl. I will say, though, that unlike most chili, this one is better fresh than left over. I can't wait to make it again. i am not a vegan, but this recipe is GGGREAT! i made it for my church event and people thought i was lying when i said it was vegetarian chili. this is a " ***** " meal! I use veggie sausage crumbles and brown them first for a more meat like texture. Yummie! Even pleases MEAT EATERS such as myself. A little bland. Added tons of cheese as a topping to add flavor. Overall delicious!